Today we are unveiling Luli Bunny's newest set with us called Lovely Piggies. We are such big fans of her images because they are always super cute and super easy to use in any project. They always exude such happiness, don't you think? 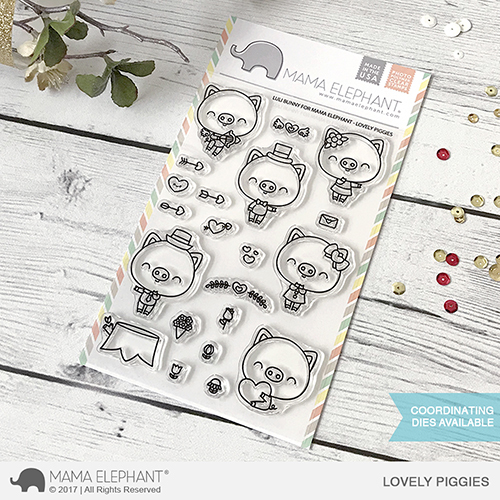 Lovely Piggies is a sweet as can be set perfect for Valentine's day or just about any general occasion! Watch the video of how I created this colorful card! Thanks for coming by today, see you again mañana! These are so super cute, love them all! Precious! And I love your little boxes. So cute. I love the scene. And the treat baskets and pigs are darling. This new set is so cute. I love these piggies!!!! Super cute projects!!! Would love to get my hands on one or ALL of these! That's such an adorable set ! !